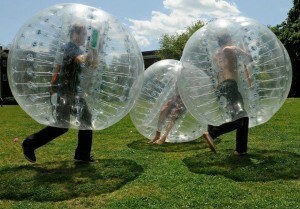 Bubble Soccer is an exciting mix between bumper cars, soccer, and sumo-wrestling. It is a sport that is a blast to play and watch. We are pleased to partner with Bubble force and offer this to our membership this summer. RENTALS – Rentals available for birthday parties, corporate events, stags and fundraisers. The rental packages include everything you need to have a great Bubble Soccer experience at Trinity soccer field, including: bubble suits, nets, soccer balls, referees, pinnies and cones to outline your field. Interested in renting equipment or hosting an event? Need a referee, 10 Battle Balls or a field to play on? Let us know – we’re here to help you out!